This just in! A one of a kind as the elongated cushion cut moissanites are no longer available. Call for pricing and info. MORRISVILLE, N.C. – January 27, 2012 – Charles & Colvard, Ltd. (NASDAQ Global Select Market: CTHR), the sole manufacturer of created moissanite gemstones, The Most Brilliant Jewel in the World®, today announced that it has exclusively partnered with Serenity Technologies, Inc., one of the world’s notable laboratories for gemstone enhancements, to create moissanite gemstones with optical properties that are remarkably whiter and brighter than ever before. Charles & Colvard is introducing these enhanced gemstones as FOREVER BRILLIANTTM, a new premier brand of Charles & Colvard Created Moissanite®, available on its e-commerce site Moissanite.com and soon through its current distributors. In creating the FOREVER BRILLIANTTM gemstone, Charles & Colvard hand selects and expertly polishes only the world’s finest moissanite. Then, through a proprietary process using extraordinary, cutting-edge twenty-first century technology, Serenity Technologies transforms each stone to a higher standard of the Gemological Institute of America’s near-colorless spectrum, up to four color grades whiter. Made of silicon carbide (SiC) and exhibiting overall properties that are close to that of diamonds but with nearly 2.5 times the fire of diamond, moissanite’s superior brilliance, luster, and optical properties rival even the highest quality diamonds. Created moissanite gemstones possess the quality, value, and resilience of fine diamonds while offering much more affordable price points. In partnership with Serenity Technologies, Charles & Colvard is bringing to the marketplace its exclusive trademarked brand of whiter moissanite gemstones – FOREVER BRILLIANTTM. Charles & Colvard and Serenity Technologies are committed to ensuring the quality and longevity of FOREVER BRILLIANTTM gems. Each stone will be accompanied by a Charles & Colvard certification and laser inscribed on the girdle for easy identification. FOREVER BRILLIANTTM moissanite gemstones carry the same Limited Lifetime Warranty as all other Charles & Colvard Created Moissanite® gemstones for maintaining their optical property of brilliance. The process developed by Serenity Technologies is the only color alteration process that is included under Charles & Colvard’s Limited Lifetime Warranty. Any other third-party alterations or treatments made to moissanite created gemstones are not supported by either Charles & Colvard or Serenity Technologies. Charles & Colvard, Ltd., based in the Research Triangle Park area of North Carolina, is the global sole source of moissanite, a unique, near-colorless created gemstone that is distinct from other gemstones and jewels based on its exceptional fire, brilliance, luster, durability, and rarity. Charles & Colvard Created Moissanite® is currently incorporated into fine jewelry sold through domestic and international retailers and other sales channels. Charles & Colvard, Ltd. is headquartered in Morrisville, North Carolina, and its common stock is listed on the NASDAQ Global Select Market under the symbol “CTHR.” For more information, please visit www.charlesandcolvard.com. Founded in 2001 and headquartered in Temecula, California, Serenity Technologies has focused on bringing new ideas and innovation to emerging technologies that have potential for large-scale application. Serenity’s strong portfolio of intellectual property and diversification strategies have helped develop innovative products having wide commercial application. These products cover a gamut of fields relating to color enhancement technologies for diamonds and other gem materials, protective treatment technologies for precious metals and alloys, nanocrystalline diamond coatings, hydro-oleophobic treatments for gems and jewelry, personalization and branding of jewelry articles, micro-marking of diamonds, revolutionary chemical-mechanical polishing technology for diamonds, analog archival, custom optics, and beam-based polishing, to name a few. For more information, please visit www.serenitytechnology.com. This press release contains forward-looking statements within the meaning of Section 27A of the Securities Act of 1933, as amended, and Section 21E of the Securities Exchange Act of 1934, as amended. Statements expressing expectations regarding our future and projections relating to products, sales, revenues, and earnings are typical of such statements and are made under the Private Securities Litigation Reform Act of 1995. These forward-looking statements include, but are not limited to, statements about our plans, objectives, representations, and contentions and are not historical facts and typically are identified by use of terms such as “may,” “will,” “should,” “could,” “expect,” “plan,” “anticipate,” “believe,” “estimate,” “predict,” “continue,” and similar words, although some forward-looking statements are expressed differently. All forward-looking statements are subject to the risks and uncertainties inherent in predicting the future. You should be aware that although the forward-looking statements included herein represent management’s current judgment and expectations, our actual results may differ materially from those projected, stated, or implied in these forward-looking statements as a result of many factors including, but not limited to, our dependence on consumer acceptance and growth of sales of our products; our dependence on third parties for the sales and marketing of our products to end consumers; dependence on a limited number of customers; our current customers’ potential perception of us as a competitor in the finished jewelry business; general economic and market conditions, including the current economic environment; dependence on Cree, Inc. as the current supplier of the raw material; intense competition in the worldwide jewelry industry; the financial condition of our major customers; risks of conducting business in foreign countries; the pricing of precious metals, which is beyond our control; our ability to protect our intellectual property; and possible adverse effects of governmental regulation and oversight, in addition to the other risks and uncertainties described in our filings with the Securities and Exchange Commission, or the SEC, including our Annual Report on Form 10-K for the fiscal year ended December 31, 2010 and subsequent reports filed with the SEC. Forward-looking statements speak only as of the date they are made. We undertake no obligation to update or revise such statements to reflect new circumstances or unanticipated events as they occur except as required by the federal securities laws, and you are urged to review and consider disclosures that we make in the reports that we file with the SEC that discuss other factors relevant to our business. If you’re looking for a piece of jewelry that works with just about any outfit, look no further. 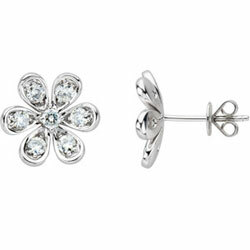 These floral design moissanite stud earrings add just the right amount of elegance to any occasion. Stud earrings are perfect “go to” earrings because they’re comfortable to wear and add just the right amount of glamor. And moissanite is becoming an increasingly popular eco-friendly choice, in place of mined diamonds. Affordable, easy to wear and sophisticated. Who could lose with these? If you’re looking for the perfect gift for the woman in your life, these are a sure bet as well. Flower design earrings with approximately 7/8ct t.w. (dia equiv) Charles and Colvard created round moissanite. Available in 14kt white gold only. Save 30% Now!! Round Moissanite Flower Design Earrings Flower design earrings with approximately 7/8ct t.w. (dia equiv) Charles and Colvard created round moissanite. Available in 14kt white gold only.